Video games are a huge hit for kids of all ages. 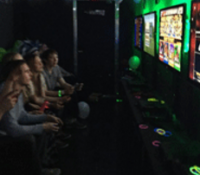 Ideal for indoor parties and family events with kids of all ages, our video game rental for parties in Boston is a great way to keep children entertained. Instead of purchasing video games only to use them on special events, you can rent the latest video games and let your young guests try them out. Then you don’t have to worry about storage or upkeep in between events. We have fun games and a variety of options that both boys and girls enjoy. If you are planning a birthday party, and you want to give your child a full selection of games, or you are planning a party at another event venue and you want to keep children entertained, plug in one of our video game systems. We have family-friendly games for younger children, active games that require movement and dancing, strategy games and more competitive games for teens, pre-teens and young adults. Families can play games together or you can create a “kids only” play section. Video games are a great addition to church events, girl or Boy Scout events, library events and even family-friendly corporate events. Total Entertainment serves businesses, families, non-profits and more all over Massachusetts and all across New England. To schedule video game rentals for parties in Boston and beyond, give us a call today.